The first battlecruisers were the product of Jackie Fisher's efforts to find a more cost-effective way to protect British trade. They were the size of contemporary battleships, trading armor for guns. The Germans answered with ships that were better-balanced, with lighter armament but battleship-scale armor. Lion was a dramatic move away from the previous lightly-armored battlecruisers and into a ship that was more of a fast battleship, although not to the extent of the German battlecruisers. The 9" belt was 50% thicker than those of the previous classes, and a 6" upper belt was fitted, something completely absent in the Indefatigables. One of the major drivers for this was the increase in battle ranges, which meant that armor was now potentially useful against heavy shells. The four 13.5" twin turrets were finally all on the centerline, including a superfiring turret forward.2 Speed also increased from 25 to 28 kts, to match the German Moltke. All of this didn't come cheap. Lion was 7,600 tons heavier than the 18,750 ton Indefatigable, 110' longer, and 8'6" wider. She was the largest warship afloat, 1,400 tons heavier than Seydlitz, the most recent German battlecruiser. However, Seydlitz had an extra 3" of belt, provided largely because of much smaller machinery spaces for nearly the same power.3 The only retrograde step was in range, which fell from 6,700 nm to around 5,600 nm at 10 kts. This is indicative of a pivot from the original mission of raider hunting to a greater focus on operations with the fleet in the narrow waters around Europe. While a great leap forward relative to their predecessors, the Lions did have a serious flaw. 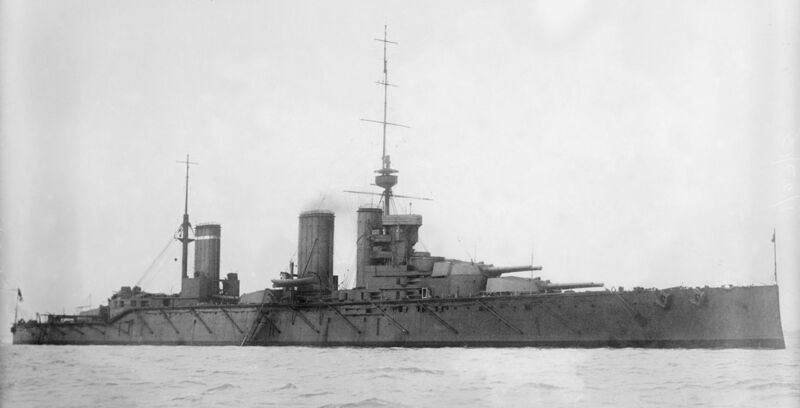 The single mast aft of the funnel common to the 1909-1910 ships was used on them, and their high-powered machinery meant that Lion's top proved totally uninhabitable during trials. The entire arrangement had to be rebuilt, at considerable expense, moving the funnel behind the top. 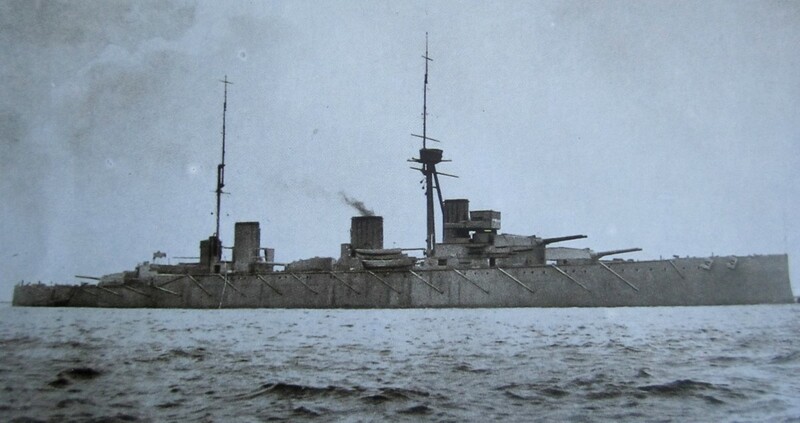 The next British battlecruiser, Queen Mary of the 1910-11 program, was a near-sister of Lion. The changes mirrored those between the Orions and the King George Vs, slight tweaks to the armor and better protection for the secondary guns. Two months before Queen Mary was laid down, another battlecruiser was started at the Vickers yard in England. This ship, the Kongo, was the lead ship of a class built for the Japanese. The other three units were built in Japanese yards, giving that nation possibly the finest battlecruisers in the world. The design was closely based on the Lion class, but the guns were 14", and the third turret was placed behind both funnels, giving better arcs of fire. The belt armor was somewhat thinner than in the Lions, 8" to the waterline and 6" above it.4 The secondary armament was 16 6" single guns and 8 submerged torpedo tubes. These ships were extensively reconstructed between the wars, emerging as early examples of the fast battleship. The Germans finally made the leap to the next generation with their 1912 battlecruiser, Derfflinger. She was only slightly larger than Seydlitz, but the 10 11" guns were replaced by 8 12" guns, in an arrangement similar to Kongo. Tirpitz was not happy with this growth, but it was increasingly difficult to hold this position in the face of the new British ships. The initial plans had the ships built with three shafts, instead of the four of previous ships, and the center shaft powered by diesel engines. This arrangement was not used when it turned out that diesels were simply not ready to fill the role, in either power or reliability. Two more ships of the same class followed Derfflinger, Lutzow and Hindenburg. 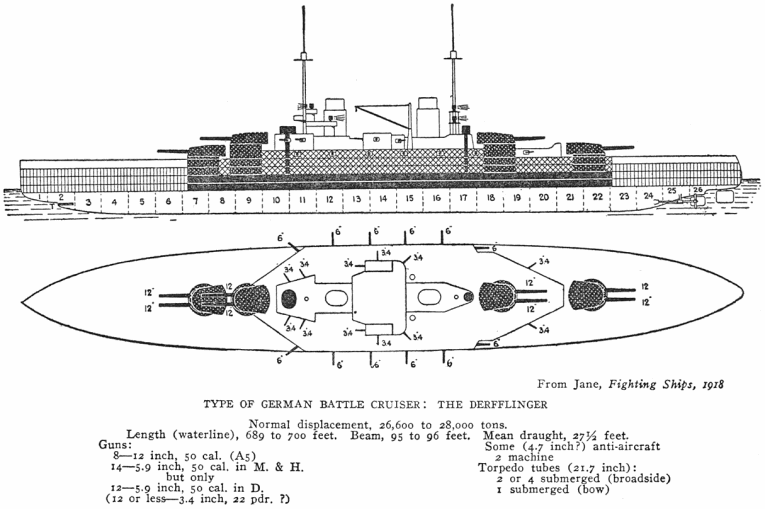 Derfflinger had been fitted with anti-roll tanks,5 but these were found to be ineffective and not fitted in the later ships. As a result, the anti-torpedo-boat armament was increased from 12 to 14 6" guns. The four submerged torpedo tubes were also upgraded to 24" in Lutzow and Hindenburg from the 19.7" of Derfflinger and previous classes. This meant an enlarged torpedo room, which proved a fatal weakness for Lutzow at Jutland when it flooded due to British shellfire. Hindenburg had more powerful engines giving her an extra knot of speed, but she was completed too late to see action. At nearly the same time as the Germans were laying down the Derfllingers, the British started the last of the "Splendid Cats", their term for the 13.5" battlecruisers,6 Tiger. She was the battlecruiser equivalent of Iron Duke, with 6" guns in casemates with 6" armor, and the former center turret moved aft of the funnels. Speed was increased to 29 kts, and an extra pair of submerged torpedo tubes were added. She was generally considered broadly equivalent to her German contemporaries, despite her heavier armament. The advent of the fast battleship with the Queen Elizabeth class meant that the British stopped building battlecruisers. This wasn't true on the other side of the North Sea. The next German battlecruiser had a contentious birth. Tirpitz was attempting to keep costs down, particularly as the German Army was getting an increasing priority for funds. The Kaiser was not happy that Hindenburg had not been fitted with bigger guns, as had the battleships of that program year, the 15" Bayern class. Eventually, the decision was made to go with 8 14" guns, as Tirptiz was still focused on maintaining a gap between the battleship and battlecruiser, and was trying to hold size down below 30,000 tons, in accordance with a promise made to the Reichstag. The first pair of the resulting Mackensen class were ordered days after the outbreak of war, and ultimately none were completed due to other demands on Germany's resources. 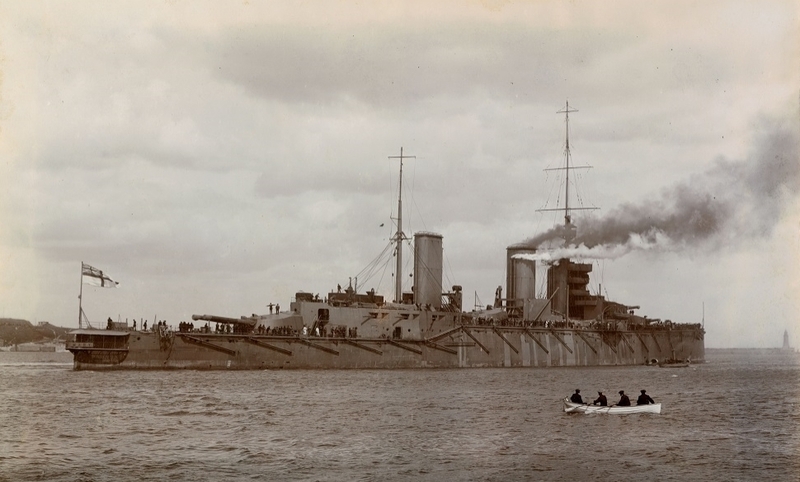 The war would give a new lease on life to the battlecruiser in British service as Jackie Fisher returned to the Admiralty, ultimately producing a true fast battleship for the British. The Germans made plans for more battlecrusiers, too, but they never carried them out. Even the Americans got into the picture, trying to buy some very large, very fast, and very lightly armored ships. We'll look at the various wartime battlecruisers next time. So, how did it possibly come about that someone thought that putting the mast behind the funnel would result in anything other than barbecued topmen?? I honestly have no clue. Maybe they thought that because it wasn't totally uninhabitable on Dreadnought, it would work for Lion, too. I really should look into that more. 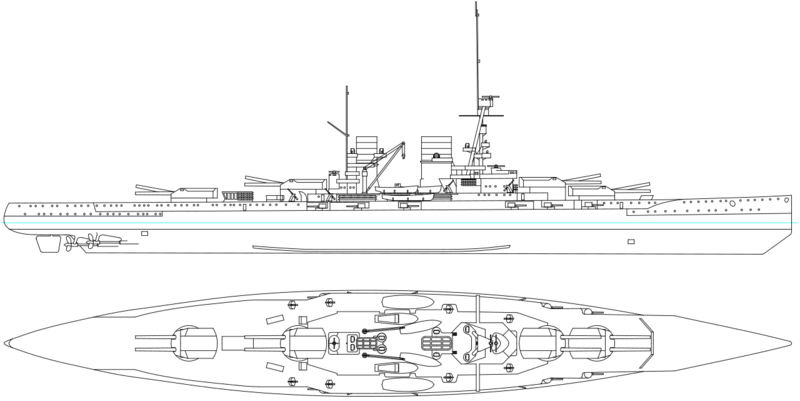 I vaguely remember reading somewhere that the German battlecruisers and/or dreadnoughts had superior protection than their British counterparts because, not being designed for long distance cruises, they didn't have space devoted to crew accommodations. I was reminded of this when you mentioned machinery access, it seems a bit too cute to be true. Do you know if there's anything to that? anti-roll tanks, but these were found to be ineffective and not fitted in the later ships. How do you build a big feature into a major warship and it turn out to not work? OK, I'll grant this in cases of actual weapons or protection, because the enemy may not cooperate with your efforts the way tests assumed. But this was stability, they could test it perfectly well anywhere they had an ocean available. Is it that it worked on smaller test cases, but in the battlecruiser it didn't scale up as expected? Did the construction mean that they got the feature wrong and it would have worked if they'd redesigned it? Or did they not even try on smaller test cases? That was a part of it. Particularly at the time, habitability standards weren’t the driver of ship size they are today, they still had an impact. The German ships were much worse than the British, to the point that, IIRC, the British on getting their first look at Baden assumed that the German sailors stayed in barracks ashore when in port because of how bad they were. They didn’t. They just had terrible accommodations. I suspect it was not scaling up well. There were lots of aspects of ship movement (pitching is a major one) that weren’t sorted out until computers became available, despite trials with models. The same problems are going to come up in this kind of dynamic fluid device. Somewhat related, the gun on the Zumwalts is effectively non functional because they stopped developing ammo for it. That's a bit different. I believe those were cancelled because it had become obvious that the Zumwalt was never actually going to fight, because it's a stupid and useless design. How do you build a big feature into a major warship and it turn out to not work? It's more common than you might think. The USS South Carolina spent a few years with no functional weapons because different computer systems onboard used different word lengths. An anti-roll tank is small change by those standards. Thanks, I think the source I'm remembering was repeating the barracks story uncritically. Don't get me wrong. There were a lot of features driven by the short range/North Sea focus of the KM. I've mentioned restricted access, and I'd guess that a ship in port is somewhat nicer to live on than a ship at sea, even if you really should be in barracks ashore. For instance, it was common to let men sleep on deck, but that's much more pleasant in harbor than while at speed in the North Sea.